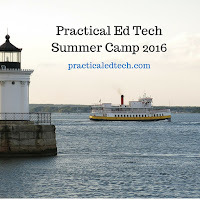 Last month I announced that I will be hosting the Practical Ed Tech Summer Camps again this year. The two day event will be held in Portland, Maine at the Holiday Inn By the Bay. The dates are July 11th and 12th for the BYOD camp and July 18th and 19th for the Chromebook camp. Discounted early registration is still available. In the last couple of weeks I have received quite a few questions about the summer camp. Those common questions and their answers are provided below. 1. Are CEUs/ certificates/ graduate credits available? The past three years I've given certificates for 16 hours of professional development. Some schools accept these for re-certification/ continuing education points and some do not. If it helps you or your administrator decide if the hours will help you qualify for re-certification, a general outline of topics for the two days is available here. There is not a university arrangement for graduate credit at this time. 2. Can I register with a purchase order / check from my school? Yes, you can. To register with a purchase order or a check from your school email me or have your business administrator email at richardbyrne (at) freetech4teachers.com and I will register you on receipt of the purchase order. 3. Are there discounts available? Yes, you can save $50 by registering for either camp before April 30th. Subscribers to the Practical Ed Tech newsletter can save an additional $25 by registering before April 30th and entering the code "subscriber" at check-out. (Note, discounts are only available for registrations completed online through the Eventbrite ticketing portals). Click here to register for the BYOD camp on July 11-12 and click here to register for the Chromebook camp on July 18-19. 4. My school is transitioning to Google Apps for Education (GAFE), will this help me? In short, yes. The both of the Practical Ed Tech Summer Camps will include the use of Google tools in each day. The Chromebook camp will have more GAFE items than the BYOD camp. We will share methods for incorporating Google tools into much of what we do. That said, this is not focused only on Google tools. Both of the the Practical Ed Tech Summer Camps are based on my framework of Discovery, Discussion, and Demonstration. The first day is focused helping students use technology to discover and discuss information. Day one of the Chromebook camp will also cover workflow on Chromebooks. Likewise the first day of the BYOD camp will cover workflow on iPads, laptops, and Android devices. The second day of both camps is focused on demonstrating knowledge by creating new digital content including podcasts, videos, and other multimedia productions. 5. I want to bring my principal, will she/he benefit from attending? Absolutely! As I've heard my friend Scott McLeod say, "the leaders must get it." This is a great opportunity for your principal to gain a great understanding of what you and your colleagues want to do when school starts again in the fall. Equally importantly, they'll learn why you want to do it. 6. My school is going 1:1 with iPads, will the BYOD camp help me? Yes. We will be looking at a bunch of apps and their applications for classrooms. 7. We would love to attend but the dates don't work for us, will you be offering this at another time? 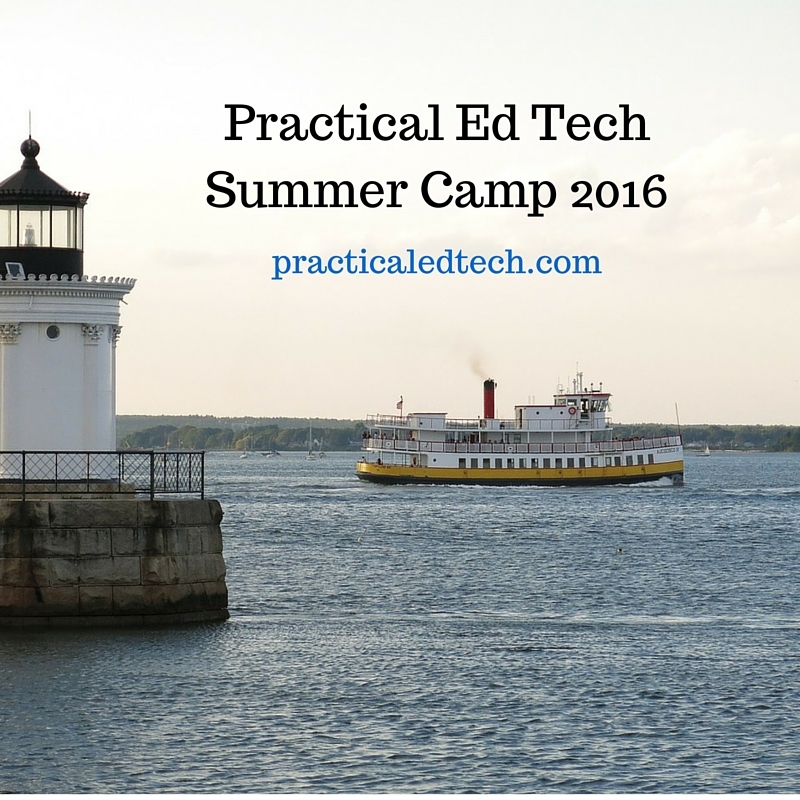 At this time I don't have plans to offer the Practical Ed Tech Summer Camps on other dates. I am more than happy to come to your school district to offer a workshop. Please click here for information about my on-location professional development services. 8. Will you be streaming this online? No. The Practical Ed Tech Summer Camps are designed to be hands-on and a livestream wouldn't capture much. 9. How do I get to Portland, Maine? What can I do once I'm there? How do I get around in Portland? Portland has an international airport (airport code PWM) serviced by American, United, Delta, SouthWest, and Jet Blue. Boston/ Logan Airport is about 90 miles away. The hotel is about a ten minute cab ride from the Portland airport. Uber is available in Portland. We’re done for the day you can walk to dozens of restaurants along the Old Port’s cobblestone streets, walk to the ocean, or even hop a boat and take a sunset cruise to see the islands in Casco Bay. Beaches are just a few minutes drive from the hotel. 10. Why aren't these events free? There are two reasons why they aren't free. First, I incur a lot of expenses in organizing and hosting the events. Second, while all of the sites and apps we will use are free, my time for teaching about them isn't free. 11. I want to sign up, where do I do that? Click here to register online for the BYOD camp. Click here to register online for the Chromebook camp. Contact me via email at richardbyrne (at) freetech4teachers.com to register with a purchase order or school check.